Yet another innovative snack idea with vermicelli. Yes, I do love to experiment with snacks and desserts. I usually make snacks for evening tea as my hubby wants to grab a snack along with tea or coffee. Each time I love bringing some uniqueness in taste and appearance. Bread snacks, banana snacks, potato snacks are some of my favorite snacks recipes that in no time makes me proud. 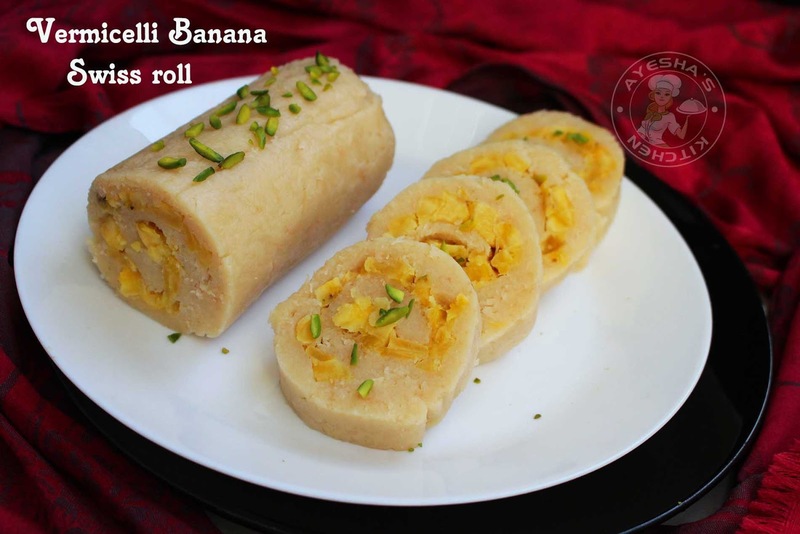 This vertically and banana sweet treat is also one among the same for sure. This swiss roll is made with cooked vermicelli mixture which is kneaded to perfection and then stuffed with roasted ripe plantain and finally rolled tightly. So easy to make snack recipe with handy ingredients. Ramadan recipes or iftar recipes must be healthy and at the same time, it must be easy to make. 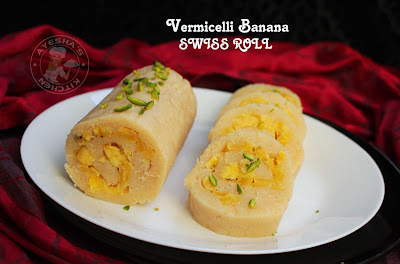 So do try this swiss roll recipe with vermicelli and banana for iftar party. So here is the recipe along with a video. So please watch this video and do not forget to subscribe my YOUTUBE CHANNEL for more videos. 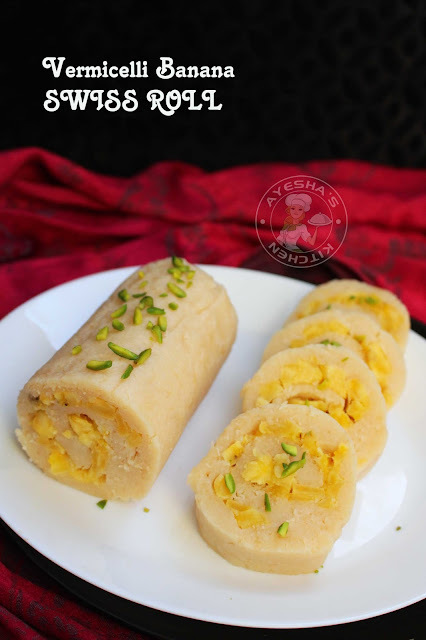 Heat a deep bottomed pan and add 1 tbsp of ghee. First lets roast the chopped ripe plantain. For that, add the chopped plantain and roast well until combined. Then add a tablespoon of sugar and saute well until done. When it is done, transfer it to a bowl. Now to the same pan, add the roasted thin vermicelli (crush it well with hands before adding). Dry roast again for a while and add 2 cups of water (for 3 cups of roasted vermicelli we required 2 cups of water). Then cook it over a medium flame until the water is dried out completely. Then add sugar (6 tbsp) and combine well. Saute for few minutes and then add milk and mix well. This gives a perfect taste. Saute continuously until well combined. Now add ghee (2 tbsp) and again mix well. You can see the vermicelli starts to leave the sides of the pan. At this stage remove from flame. Then transfer this prepared vermicelli mixture over the greased silver foil. Knead it well with your greased hands. You can use a pair of gloves while kneading as this mixture is too hot. You have to grease your palm while kneading (important). When done, roll out using a rolling pin and shape it evenly. Then spread the prepared roasted plantain over it evenly. Again roll out using a rolling pin. When done, gently roll it tightly. Smoothen the sides immediately after rolling. If the vermicelli sticks to silver foil, don't be panic, just smoothen it with your hand. Then roll the same in the greased silver foil very tightly. Keep refrigerated for 4 hours. When done, slice it and serve.